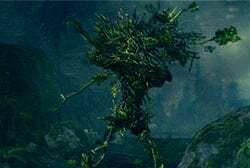 Ents is an Enemy in Dark Souls and Dark Souls Remastered. Enemies are hostile creatures that respawn when players rest at a Bonfire or upon death. Special enemies that do not respawn are classified as Bosses, Mini Bosses or Invaders. Ents are living bushes that can be found in Darkroot Garden. These enemies attack from a medium distance with whip-like vines, and have a close range grab that deals quite a bit of damage for how early in the game they can be encountered. Not too hard to defeat one on one, but their attacks are quick, don't telegraph well, and have a long range, making them troublesome when engaged in groups. They often drop moss clumps on death, making them the best source of poison, toxic and bleed curing items in the game.Be careful of its 2 hit combo though. Its torso will twist around, and swing its arm back, and then twist back around and launch a medium range attack with its vine/arm. Easily blockable. Good time to some hits in after a successful block. Both its vines/arms will go over its head, and then will swing forward for a medium/long range attack with long wind up. Another easily blockable attack, but do not release your block until it stands normally, it's vines can still hit you if you are very close to the Ent after the first few initial seconds of the animation. Again, it's easy to get some hits in after a block. When the player is very close, it will throw its arms partly up (making it difficult to distinguish from their second attack) and then grab you, it is possible to escape this grab by repeatedly tapping L1/R1 in order with minimal damage, or, proceed to get dealt heavy damage for around 3-5 seconds while you are unable to move. This attack is the most dangerous one as it can't be blocked; avoid getting close to Ents for too long unless you're staggering them to avoid this attack. All its attacks are easy to interrupt if you have a decent damage weapon. If you can take him down in a few hits, just charge in after its initial attack and start whacking. Ents are very weak against fire. The grab attack is very easy to bait for a heavy punish. Some are "rooted" in the ground and will pop up when aggro'd. They look like spiky bushes, if you can spot them you can power attack them before they can aggro you, after hitting them you'll aggro them anyway. Darkroot Garden is fairly easy to access early in the game, making these enemies attractive for farming moss clumps in preparation for entering Blighttown. So they&apos;re Ents now, huh... dank.